The Bedlam of Beefy: What a Bulmer! All of this gloriousness from Edward Bulmer. I'm loving on that velvety green. And I like that they're raised w/ feet. I kind of regret getting a couch that sits so low to the ground, as it's so heavy in the room! 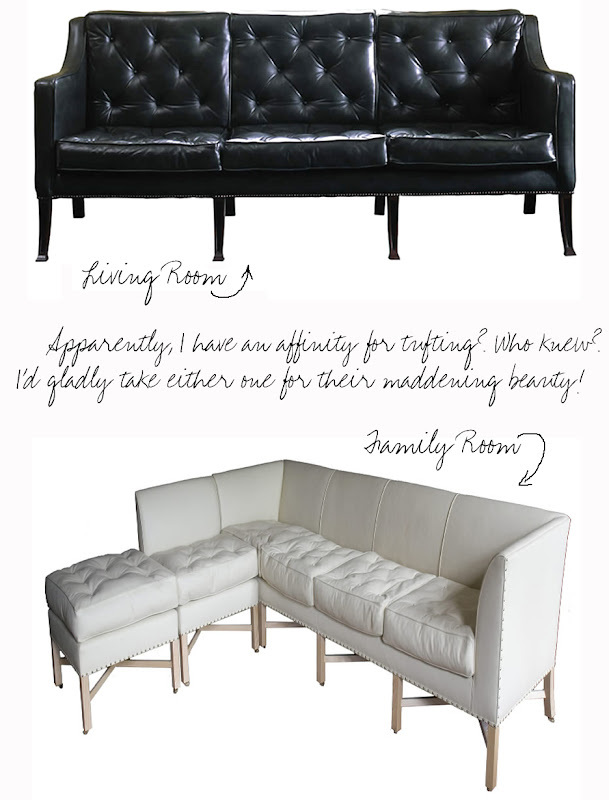 you just need a tufted fainting couch now! I could surely live with that black one! what a beaut! YUMMMY, the black and the green ring my bell! Love the green sofa....how many sofas are acceptable for a girl to own? hey Uncle B - we might disagree politically, but we do both agree on how cool a fine piece of tufted leather couch really is. be well, brother. big time jealous, btw, that you all have some serious fall weather to enjoy. i'm stuck in perfect 80 degree monotony here in SoCal. ugh.